Towering formations of lichen-crusted rhyolite frame the entrance to Cave Creek Canyon. The largest of the “sky island” mountain ranges in the Coronado National Forest, the Chiricahuas are home to animals and plants found nowhere else in the U.S. The town of Portal is the gateway to world-famous Cave Creek Canyon. Traveling on Hwy 80 toward Portal from Douglas you will pass through rolling grasslands punctuated by the cones of extinct volcanoes; watch for Burrowing Owls and Pronghorns along the highway. As you cruise up Portal Road west from Hwy 80, grasses give way first to thorn scrub then to a variety of evergreen oaks. Some residents in the Portal area welcome visitors to their backyard feeding stations; for information on current opportunities, inquire at the Portal Store in town or the ranger station up the road. Beyond Portal the road passes the U.S. Forest Service ranger station and winds along Cave Creek; watch for Elegant Trogons all along this stretch, particularly where Arizona Sycamores grow close to the road. The road to the famous South Fork Zoological and Botanical Area takes off to the left near the Sunny Flat Campground. This day-use-only area is closed to collecting year round and to use of recording equipment or playback of taped calls during nesting season to protect trogons, owls, and other birds. The entrance road offers excellent birding which is all too often missed by those hurrying on to the trailhead. The bridge is often a particularly productive stop. The parking area and turnaround at the end of the road, moved closer to the main road following major flooding in 2014, is narrow and often crowded with cars; large RVs or vehicles with trailers may not be able to negotiate it. A mandatory $5.00 fee per vehicle funds maintenance of campgrounds, picnic areas, and trails; the pay station is self-serve, so be sure to have small bills. The half-mile section of trail between the new and old trailheads traverses long stretches of loose gravel and cobbles left by the flooding; sturdy boots with ankle support are recommended, and a hiking stick may be helpful. A pit toilet remains at the old trailhead, but there are no facilities at the new parking area. About 2 miles past the turn-off to South Fork is the Southwestern Research Station, a research facility of the American Museum of Natural History. Visitors are welcome to observe the station’s hummingbird feeders, which attract a good number and diversity of birds in season, but please remember that this is a scientific facility with research in progress. A small selection of books and gifts is on display in the main office near the visitor parking area. 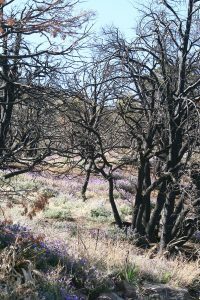 The station is open spring through early fall, and lodging with meals is offered to non-scientists as available; call (520) 558-2396 or visit the SWRS Web site. 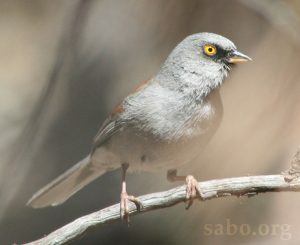 Yellow-eyed Juncos are common residents in the higher elevations of southeastern Arizona’s “sky island” mountains. 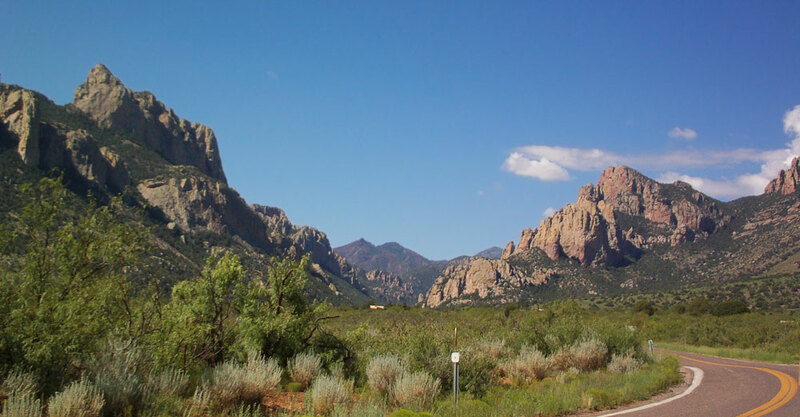 Rustler Park in the Chiricahua Mountains and the Carr Reef Campground in the Huachuca Mountains are two of the easiest places to see them in spring and summer. The pavement ends a short distance beyond the research station and the road begins to climb toward the high, cool conifer forests atop the mountains. The route over the top of the Chiricahuas is a wonderful (if sometimes nerve-wracking) drive from April through November, but heavy snows force closure of this road in winter. At Onion Saddle, one fork leads to the campground at Rustler Park, a good stop to look for high-elevation species such as Mexican Chickadee, Red-faced Warbler, Olive Warbler and Red Crossbill. The campground and picnic area has been renovated following the Horseshoe 2 wildfire in 2011. The mandatory day-use fee of $3.00 per vehicle funds maintenance of campgrounds, picnic areas, and trails; the pay station is self-serve, so be sure to have small bills. Nearby Barfoot Park is an alternative for some quiet birding if Rustler Park is crowded (as it often is on summer weekends). A reintroduced flock of Thick-billed Parrots made their home in this area in the late 1980s; this reintroduction effort, involving both wild birds confiscated from smugglers and captive-bred individuals, ended in disappointment, but there are still hopes of returning this magnificent bird to the sky islands. Warning: Large RVs and vehicles pulling trailers may not be able to negotiate the tight curves on this narrow mountain road! On the west side of the range lies Chiricahua National Monument, also known as “The Wonderland of Rocks.” Eerie spires of rhyolite are the park’s biggest attraction, but wildlife is also abundant. Watch for the occasional Zone-tailed Hawk or Golden Eagle soaring high above the formations and Hepatic Tanager, Juniper and Bridled titmice, Grace’s Warbler and Strickland’s Woodpecker in the lush forests of the canyon bottoms. The second Berylline Hummingbird nest ever discovered in the U.S. was found here. The park is accessible from the Sulphur Springs Valley via Hwy 181 from Sunizona or Hwy 186 from Willcox, or you can stop in on your way down from Onion Saddle.